For the first time, a spacecraft orbiting Mars has detected glass deposits inside craters on the red planet — a possible boon in the hunt for signs of past Martian life. Researchers think that the glass was created when impactors (meteoroids, asteroids or comets) slammed into Mars, superheating the Martian dirt and turning parts of the surface into glass. Scientists using NASA’s Mars Reconnaissance Orbiter (MRO) were able to see glass on the surface of the red planet using the spacecraft’s sensors. The new Mars glass study was published this week in the journal Geology. 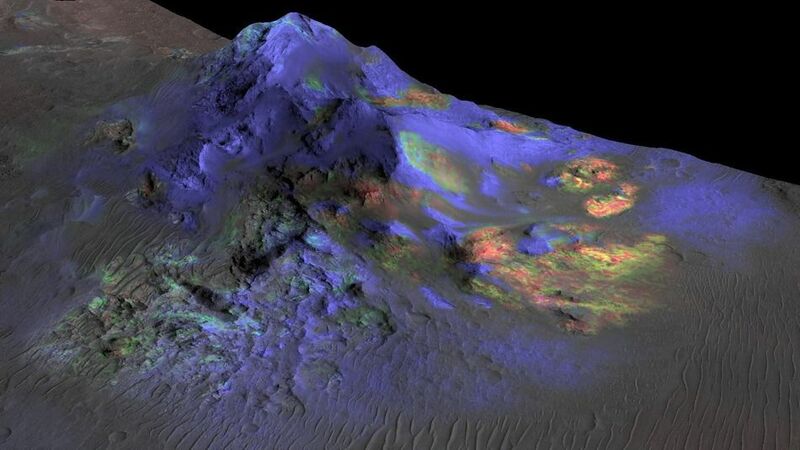 Researchers on Earth have been able to learn about past life on this planet by studying glass deposits left over from impacts, so it’s possible that researchers studying Mars can do the same thing with the red planet. A study last year “found organic molecules and plant matter entombed in glass” created by an asteroid impact in Argentina millions of years ago, NASA said. An artist’s concept of NASA’s Mars Reconnaissance Orbiter. Brown University scientists Kevin Cannon and Jack Mustard decided to try to detect glass on Mars using lessons learned from the Earth-based study — but it’s not easy to detect glass on a world millions of miles away. So Cannon started in a lab. He created glass by superheating powders and then measured the spectral signal — the unique band of colors emitted by the glass. Cannon provided that information to Mustard, the deputy principal investigator for MRO’s Compact Reconnaissance Imaging Spectrometer for Mars instrument, who used that signal to compare it to other spectra gathered from the red planet. Boom: Mustard found multiple matches. MRO data shows that several craters on Mars house glass deposits that were probably formed during impact events. Much of the glass was found in the central peaks of Martian craters, meaning they were likely created from impacts, according to NASA. MRO arrived at Mars in 2006 and has been beaming back information about the red planet ever since.